1. All standard slimes are made the same way! Say what? Yes. Seriously. 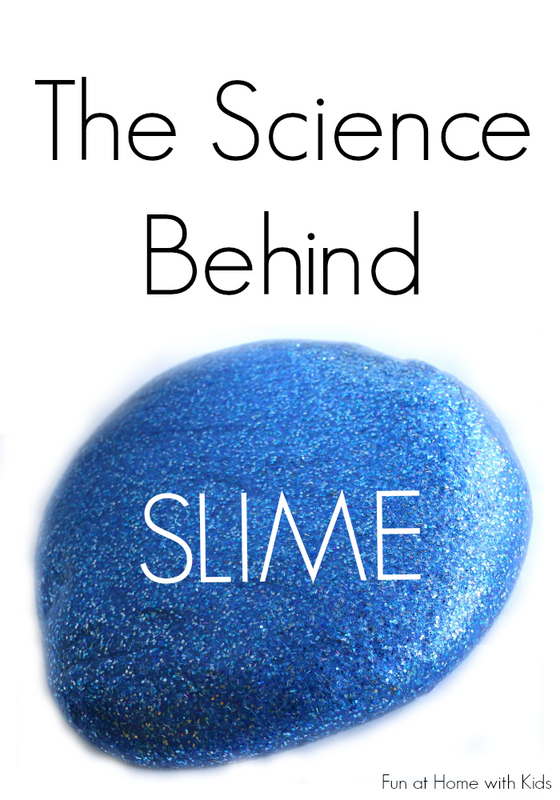 The storebought slime, the borax slime, the liquid starch slime, and even our laundry detergent slime - they all are created from the same reaction! I thought this was SO interesting. Now mind you, there are additional ingredients that vary between each which may result in minor differences between each - but those additional ingredients play no role in forming the slime. So how does slime form? You need two things: polyvinyl alcohol (a main ingredient in washable school glue) and borate ion (which you can get from borax, sodium tetraborate, or boric acid). What happens is that the polyvinyl alcohol in washable school glue is attracted to the borate ion from borax, sodium tetraborate, or boric acid (depending on whether you are using borax, liquid starch, or certain brands of laundry detergent). This attraction makes the two molecules form long chains, and tons of those chains together form the slime we love! Even though Borax (from, well, Borax and also from Sta Flo liquid starch) and Boric Acid (from certain laundry detergents) are different chemicals, in the presence of water they change into Borate Ion. This is why you add water to borax powder if you are preparing slime using a borax-based recipe. Sta Flo and the certain laundry detergents that work have water added to them already, which is why you don't need to add any additional water to these slime recipes. Just like Oobleck! This means that it's behavior (viscosity) can change. You know how when you squeeze oobleck in your hands it's hard and when you hold it gently, it ribbons down? Well slime has a weird property too - if you stretch it slowly it will stay together, but if you pull it abruptly it will snap/break. This was something I tried because I was curious - and it worked perfectly! I'll admit that I'm not 100% on the scientific explanation for it, but I suspect that the acetic acid (which is what vinegar is made of) disrupts the hydrogen bond (the attraction) between the PVA molecule and the borate ion. You know the geek in me LOVES this! I will be linking to it in my slime experiment tomorrow! Thank you for being awesome! Aw, thanks Dayna! I finally got around to hitting publish! YAY! The nerd in me is so fascinated by this! It's so nice to have a much more clear understanding of it all!! Love the explanations Asia! I learned so much! Borax in solution forms boric acid. Boric acid reacts with water to form boron tetrahydroxide ion. It is this ion which forms the cross-links between the polymer miolecules, making slime. Vinegar contains acetic acid, which is stronger than boric acid, so adding vinegar eliminates the boron tetrahydroxide ions from the solution. Without these ions, the cross-links are destroyed and the slime breaks apart. Now I can use this.Whats your name?I 've got to give credit. thanks.needed this for a school project and we needed an explanation and this was perfect.I won't forget to give credit!!! Hi there, i made this in science class at school and i noticed that the slime got hard as the day went on. I was wondering if you would know the reason why. If you left it out or played with it a lot, the water content would reduce and the glue may start to dry out. Add more liquid starch or borax/water and keep it stored in an airtight container when not in use and that should take care of it. Thanks!! It helped with my project. Wow! I really didnt know all this stuff! I thought your a genius who knows everything about science! Oh My goodness thanks so much for this im doing my science fair project on slime and needed to find some good sources you are helping so much thanks Asia!!! !